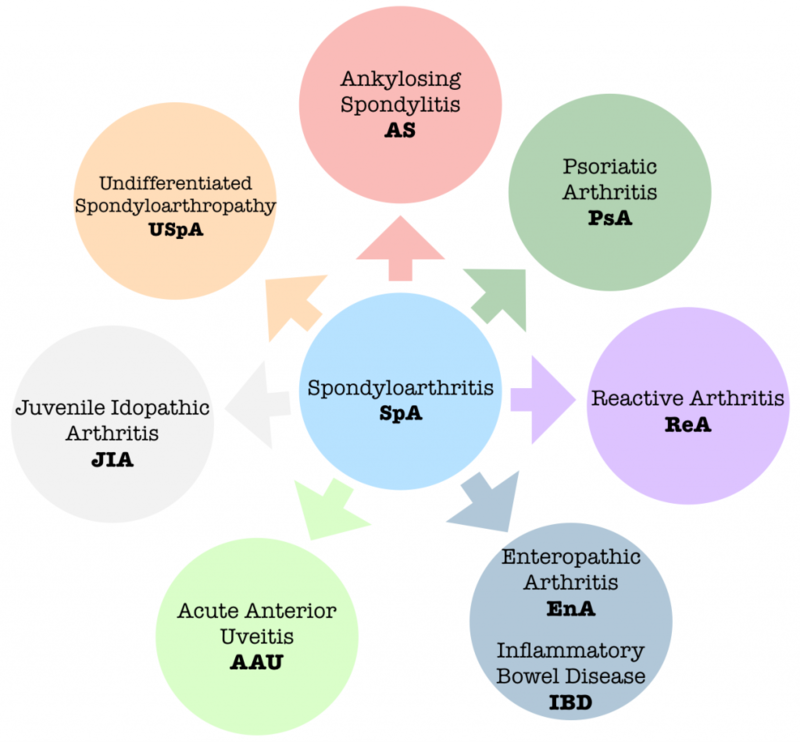 Spondyloarthritis (SpA) is a term used to describe a group of inflammatory arthritis diseases. The most common being Ankylosing Spondylitis (AS). Commonalities of SpA are inflammation that attacks the spine, and in some people, the joints of the arms and legs. It can also involve the skin, intestines and eyes. Ankylosing spondylitis is a form of arthritis that primarily affects the spine, although other joints can become involved. It causes inflammation of the spinal joints (vertebrae) that can lead to severe, chronic pain and discomfort. In more advanced cases this inflammation can lead to ankylosis — new bone formation in the spine — causing sections of the spine to fuse in a fixed, immobile position. AS makes me feel like I have aged 60 years! I feel so stiff, so slow, so tired, and sometimes very exhausted. Once, I was as flexible as a dancer – I worked at it, but today I struggle to put on my shoes. I used to be full of energy, never stopping, now I tire easily and need way more rest. Generally, pretty much everything is a lot harder to do. The most common early symptoms of AS are frequent pain and stiffness in the lower back and buttocks, which comes on gradually over the course of a few weeks or months. At first, discomfort may only be felt on one side, or alternate sides. The pain is usually dull and diffuse, rather than localized. This pain and stiffness is usually worse in the mornings and during the night, but may be improved by a warm shower or light exercise. I feel like a non-stop 10km 15% climb with a loaded bicycle is nothing compared to the constant daily pain of AS! Back, head, hips, legs, feet, neck, shoulders… everything hurts so much. Sometimes the pain is so strong that it jolts me awake at night. Concentration has also become difficult and my mind is often cloudy. In the morning, I awaken feeling so stiff that it can take more than an hour to get out of bed. A rheumatologist is commonly the type of physician who will diagnose ankylosing spondylitis (AS), since they are doctors who are specially trained in diagnosing and treating disorders that affect the joints, muscles, tendons, ligaments, connective tissue, and bones. A thorough physical exam, including X-rays, individual medical history, and a family history of AS, as well as blood work (including a test for HLA-B27) are factors in making a diagnosis. I had 3 MRIs, 2 spinal injections, several blood tests; I saw my family doctor, a slew of physiotherapists, a couple of radiologists, and finally a rheumatologist before being diagnosed; that process took almost a year but the pain had been there for five years already. I wasn’t really taking it seriously until an accident and the pain became unbearable. That’s when they found an herniated disc causing an inflammation of my sciatic nerve. That didn’t help the diagnosis… it masked the inflammation caused by AS. During the rehabilitation for the disc, and before my diagnosis of AS my mental and physical condition worsened dramatically. A common treatment regimen for the various forms of spondyloarthritis (ankylosing spondylitis, psoriatic arthritis, enteropathic arthritis, reactive arthritis, juvenile spondyloarthritis, and undifferentiated spondyloarthritis) involves medication, exercise, physical therapy, good posture practices, and other options such as applying heat/cold to help relax muscles and reduce joint pain. In severe cases, posture correcting surgery may also be an option. There are a number of different types and classes of medications (NSAIDs, Corticosteroids, TNF inhibitors, Methrotrexate, etc.) used in the treatment of ankylosing spondylitis and related diseases. Note that different people respond to different medications with varying levels of effectiveness. Thus, it may take time to find the most effective course of treatment. Move those bones, don’t give them a chance to fuse! That was one of my first mottos. Of course, depending on the severity of the condition, the flare and the pain, the way to treat has to vary and be adjusted. But to me until we understood the source of the problem I couldn’t address the appropriate treatment; that was a big problem. AS made me insane! Once diagnosed, I have finally been able to try to treat step by step and level by level. For me, who grew up with a non-conventional medicine approach, taking NSAIDS to try to reduce the inflammation wasn’t easy to accept at first but I did, and it helped! From then I have been able to regain some strength and mobility. But only by working at it every day! Today, that’s all I take and I have managed to come very far. I want to give myself and my body a chance, back in my normal active life, to see how my body reacts to a mild treatment of NSAIDS. Only after trying this will I maybe consider another treatment. It’s important for me to fully understand my options and fully reflect on the reasons and consequences for taking certain treatments. I am using every resource I have to learn more about the disease and the treatments, My youth, my strength, and my disease and my self care to find an appropriate treatment strategy for me. Treatment is lifelong and it may only reduce the severity of the symptoms. One of the best ways to take care of your health if you have ankylosing spondylitis is to take a proactive role in your own treatment – a process called self-management. Learning how to live with Ankylosing Spondylitis has now become a large part of my life — thanks to the diagnosis I can act with confidence! And that means much more than just doing sports or eating a balanced diet. It’s more like a wheel where everything is connected and every aspect will affect the other (physical, psychological, spiritual, emotional, personal, professional) with me and my AS in the middle. And I’m trying to fully understand the constantly changing needs in order to act accordingly; it’s a process of self-actualization, self-discovery, self-development, self-mastery. Now, more than ever, I stand up when I need it, I move when I have to, I am aware constantly of my posture… AS has become an integral force of my self-care. Hope in Motion is an inclusive project that grows with the people who become involved with it. We invite everyone to participate in the ways that they can or would like to. We are excited to present a few ways to get started. Use #hopeinmotionlife to share how you triumph over AS or SpA (or other adversity) with a photo that you feel describes it well. There are no small victories; don’t hesitate to share the moments that show how you keep enjoying life! Whether sitting at a table with friends or gardening with your grandchildren or climbing a mountain #hopeinmotionlife is a conversation about sharing courage and happiness in the face of adversity. We’ve started a Facebook page to connect with other people affected by SpA. It’s been a great tool to connect with other groups and associations as well. Our page is used to post quick updates about the journey and a space used for exchanging inspiration, support, and compassion. We encourage everyone to leave a comment, like the page, what ever you do, join the conversation! We would like to showcase inspiring stories about people from around the world living with SpA. And even if it’s not just SpA. If you or someone you know would like to have a story written and a portrait taken to be featured on the website we are looking at the #hopeinmotionlife conversation on Instagram as well as looking to meet people in person so don’t hesitate to contact us. You can participate in other ways too! If you’ve got a bit of space, we always appreciate being able to set up our tent for a night and exchange stories, share a bike traveler’s dinner. Or even just a lunch. Check out our route and if you think you’re somewhere nearby or even far away we may be able to make a detour to meet up. Can’t meet up? In this technological age, we can also meet on Skype, Whatsapp, etc. Just reach out! Thinking on a collaboration? or if you would like to invite us to an event, write an article for your site, or participate in your project, let us know. We are happy to work with others trying to bring about positive change. 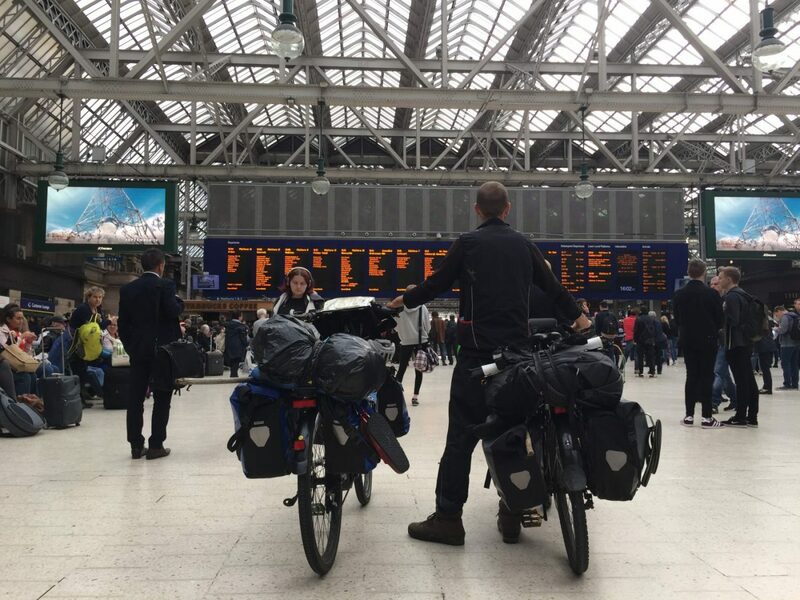 We are also interested in doing conferences on living with AS, SpA, and also traveling the world by bicycle. So if you’re looking for someone, you know what to do! Get in touch. Did your back pain start before you turned 40? Did your symptoms develop gradually? Do you feel better after being active? Has the pain been around longer than 3 months? Does your body feel stiff in the morning? If you answered yes to more than one of these questions, click the button below to find out more. Here are some good places start learning about SpA and AS, some groups to connect with, and some other resources that we’ve used in making this website. The associations, in particular, have been a great place to learn and connect. A special thanks to those who work hard to create groups, sites, and make information easier to access. They’ve really helped us out and it is our hope that they will do the same for you! Walk AS One – mobilizes and motivates a global community to raise awareness and address the challenges of everyone affected by Ankylosing Spondylitis and its family of related diseases. Reach The Top – an association created to raise money to fund research for Ankylosing Spondylitis. The objective of Romain, athlete who has this pathology, is to climb the highest peaks around the world. IMMAKAYAK – Incredible! 3 guys (1 affected by Ankylosing Spondylitis) who are going to kayak 400km in the middle of Icebergs in Greenland. Raising funds for the Spondyloarthritis association ACS-France.